Simply click on the banner, check out the awesome free and .99-cent great book deals, download, and share to register to win a $200 Amazon Gift Card!!! Imagine what you could buy for yourself. Or...since you'll receive the gift in plenty of time for Christmas shopping, for others. Entering is easy... First just Tweet about the giveaway for a FREE entry... Then more options will pop up. You can like a Facebook page... Or...earn up to ten points for every book you download. Yep...even the FREE and .99 cent books. Enjoy! 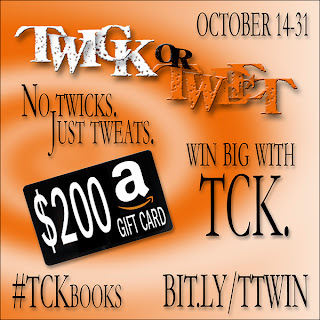 TCK Books Twick or Tweet! Great giveaway! And some great deals on great books!